This week’s employee pick is from Brandy, who is now at our Harbison location. 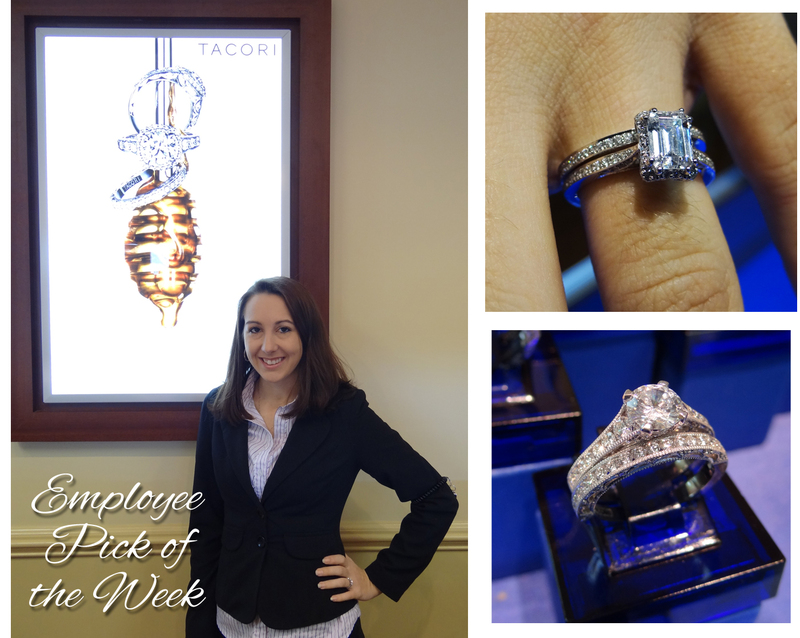 She picked the beautiful collection of Tacori. Each Tacori piece is handcrafted by artisans in California. These are remarkably detailed, and spectacular pieces of jewelry that will be cherished for generations to come. Each piece goes through the hands of 20 craftsmen before it’s finished! The rings of Tacori come in a variety of styles and collections. The pieces come in 18k gold, platinum, rose or white gold. Tacori can also make custom rings as well. Below is a chart with the variety of shapes Tacori offers. Do you want a simple, yet elegant look? Try the collection called “Simply Tacori”. As the name suggests, these are classic pieces with the glamorous handmade appeal of the Tacori brand. The romantic ribbon twist look in the collection of “Tacori Crescent”… for those that want a unique and feminine look to their ring! The “Hand Engraved” collection includes pieces with details that subtly accent just the interior ridges of the ring, or include engravings on the entire piece. The “Dantela” collection includes pieces that have an elegant straight string of diamonds, that move across the piece, for an amazing look. They also come in eternity bands, or diamonds half way around the ring. We have Tacori bands, semi mounts and rings that include the center stone. Each Jewelry Warehouse store has an ipad application that will have more information about the rings. When you purchase a Tacori ring, it comes with a lifetime warranty which includes sending your your ring to have its “spa” treatment! Already own a Tacori ring and want to trade it in for a different style? Tacori rings have a 75% trade up and the diamonds have a 100% trade up. If you have any more questions about the Tacori line, stop by any Jewelry Warehouse location and our diamond experts would be happy to help! See our Tacori Collection here – We have more to offer in our stores, so stop by today! This entry was posted in Jewelry, Jewelry Brands, Jewelry News, Jewelry Trends and tagged diamond rings, diamonds in columbia sc, engagement rings, engagement rings columbia sc, jewelry warehouse, tacori, tacori jewelry collection. Bookmark the permalink.